Future of Sourcing Digital is excited to launch a new series titled “Rising Starts of Sourcing.” This series will recognize individuals newer to the industry whose thought leadership and expertise have shown promise that is likely to have a lasting impact on the industry. 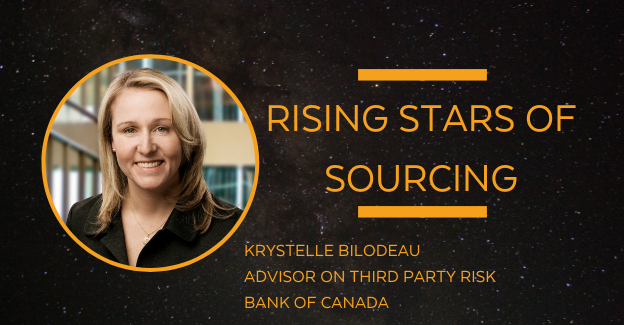 We are excited to kick off this series with Krystelle Bilodeau, who was the recipient of the Rising Star Award at SIG's Global Executive Summit in the Fall of 2018. Krystelle Bilodeau is currently Advisor on Third Party Risk at the Bank of Canada. Krystelle has worked in the financial sector for over 16 years with 11 years at the central Bank. Throughout her career, Krystelle has established herself as a versatile professional holding leadership positions in a broad range of areas including Director of Retail and Wholesale Debt Administration responsible for large and complex outsourced operations. My history with sourcing and third-party risk management came as a bit of an accident. As part of my responsibilities as Director of Retail and Wholesale Debt for a central bank, I became responsible for a large and complex outsourced relationship. This required that I become a bit of an expert as well in sourcing, relationship management and third-party risk management. And so I looked to build my networks, make contacts with experts and get involved in projects that would help me be a thought leader in this aspect of the work that I was responsible for, and that’s where my passion for the field started. I was provided the opportunity to get involved and collaborate on several initiatives that not only helped me do my job, but also helped me learn, grow and give back. Well, I don’t work in sourcing. My career has been in the financial industry, the past 12 years of which have been for the Bank of Canada (Canada’s central bank). The Bank has allowed me to work in some very different fields – from retail debt management, to strategic planning and business excellence, to currency education and awareness, to the office of the COO, to risk management – where I am at the moment for the next year renewing and implementing a new third-party risk program. I’m not sure what is in store for me next, my only requirement is that I continue to learn something new, be challenged and add value to my organization. What do you feel sets you apart as a rising star in sourcing? Contribute to Linda Tuck Chapman’s book "Third-Party Risk Management: Driving Enterprise Value"
So, I would say perhaps my enthusiasm for extracurricular interests may contribute to this distinction. Yes, yes and yes! I very much value the perspectives and inputs of colleagues and distinguished professionals. I have always made a point of having two mentors (one in the private sector and one in the public sector). I consult not only on my career path and opportunities, but also on how to handle tricky situations, or how to position or brand myself. I have never expected a mentor to help promote my career, but rather one who provides thoughtful and honest advice. What professionally motivates you and gives you drive? Having responsibility; coaching, mentoring and seeing others achieve their objectives; and feeling like my contributions add value for the organization. 2019 is a year for me to learn – I have been given an opportunity to learn more about third-party risk from a process and implementation perspective and I intend to maximize that learning to further my thinking. I also have the opportunity to work for an organization and in positions that allow me to get involved in many other areas of the Bank and learn about what they do – I intend to continue to do that as well. A growing concern that is getting more attention these days (certainly in the risk space, but also in the public governance space) that I think may become a trend in sourcing is the growing concern for the threat of ecological collapse. I think a trend for activity and discussion around ecologically responsible sourcing may see an upswing over the next while. Another is the increased concentration in technology players and the risks of that concentration (in our third, and nth parties) not only on our organization but in the larger systemic context. What tips do you have for maintaining a work-life balance? Compartmentalization – I try to segregate my day job from my home job as a mom. I will go into the office at 4 a.m. to get something done rather than mingle it with my home life. It keeps me sane. Exercise – always good for mind, body and spirit! Get curious and get involved. Krystelle Bilodeau is currently Advisor on Third Party Risk at the Bank of Canada. Krystelle has worked in the financial sector for over 16 years with 11 years at the central Bank. Throughout her career, Krystelle has established herself as a versatile professional holding leadership positions in a broad range of areas including Director of Retail and Wholesale Debt Administration responsible for large and complex outsourced operations, and as Director of Awareness and Education in the Currency Department during Canada’s successful transition from paper-based to polymer-based currency. Most recently, Krystelle was Special Assistant to the Bank’s Chief Operating Officer advising on a wide range of corporate programs and initiatives. Krystelle has contributed to several written works including: co-author “An introduction to Public Education and Communications on Bank Notes” published by the International Banknote Designers Association, and contributed to “Third-Party Lifecycle and Risk Management – Driving Enterprise Value”. Krystelle is also a member of the Sourcing Interest Group’s Thought Leader’s Council, Faculty Member for SIG University’s Certified Third-Party Risk Management Program, and a member of the Strategic Direction Committee for the Bank of Canada’s women’s leadership network - PotentiELLE. Krystelle holds a BA in Communications and a Master’s in Business Administration from Wilfrid Laurier University.